Betterman argument analysis: What “prejudice” counts, and what is the remedy, for an inordinate delay in sentencing? Yesterday’s transcript in Betterman v. Montana suggests that the Court is agreed on perhaps two major constitutional points: First, the Due Process Clause rather than the Sixth Amendment right to “speedy trial” may provide the better foundation for complaints about delay in sentencing. And second, even if the Due Process Clause provides the source, the appropriate mode of analysis may be the Sixth Amendment’s four-factor Barker v. Wingo “test” for speedy trial violations. As Assistant to the Solicitor General Ginger Anders put it late in the fifty-seven-minute argument, “[w]hat we’re concerned about is the substantive standard, and the remedy,” not so much the constitutional foundation. Still, as the saying goes, the devil is in the details. We shall see, when Conference voting settles, whether the Court’s opinion will also lay down some specific guidelines for judging the constitutional claim, and any remedy, in sentencing delay cases. Brandon Thomas Betterman pled guilty for his failure to appear for sentencing in a prior criminal matter. He waited in jail for his sentencing in that case, instead of going to prison for the prior case. After nine months (some of them spent resolving his own motions), Betterman asked for his sentencing to happen soon. He later alleged that the jail did not provide certain rehabilitation programs that were available in prison, and also that he was “anxious” and wanted to be sentenced so that his time on the new sentencing would begin to run. But the Montana trial court communicated that civil matters had to be attended to first, and Betterman was not sentenced until five more months passed. He did not get credit, against his new sentence, for the time he’d been in jail; that time was attributed by the state court to his prior sentence. On appeal, the Montana Supreme Court ruled that “the majority of the delay in [Betterman’s sentencing] is attributed to the State,” but that his claims of prejudice were “speculative” so that no remedy was appropriate under the Due Process Clause – and the Sixth Amendment’s speedy trial right does not apply at all to sentencing delays. At yesterday’s oral argument, Justices Ruth Bader Ginsburg, followed by Justice Elena Kagan, quickly established that Betterman is not demanding that the criminal case against him (to which he pled guilty) should be dismissed. Rather, the case is about how to analyze a constitutional sentencing delay claim, and what “remedy” might be fashioned. Justice Sonia Sotomayor then asked, early on, “if we were to disagree with you and say that there’s no Sixth Amendment right, and there was only a due process right, have you waived” the due process argument? It soon seemed clear that all of the Justices who later spoke (including Justice Stephen Breyer during the argument of Dale Schowengerdt, Montana’s solicitor general) seemed to agree that, indeed, the Sixth Amendment is not the source of any right to speedy sentencing – but that nevertheless, the Due Process Clause might still afford a remedy for “inordinate,” as Justice Samuel Alito put it, sentencing delay. 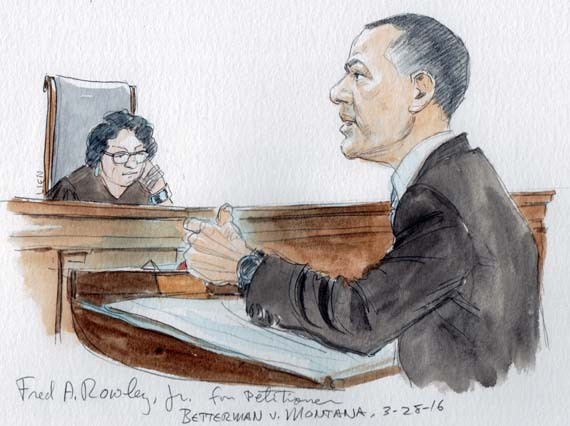 As to due process, Fred Rowley Jr., arguing for Betterman, conceded to Justice Sotomayor that “we didn’t include [a due process claim] in the question presented.” But a major part of Rowley’s argument is that the “tests” for analysis under the Speedy Trial Clause, versus the Due Process Clause, are significantly different, and that the specific facts of Betterman’s case show why that difference matters. Thus the Justices still seemed eager to discuss due process. Justice Kagan pointed out that in a prior case (United States v. $8,850, a 1983 forfeiture case), the Court had ruled that “we’re going to do a due process analysis, but we’re going to take the [Speedy Trial Clause] Barker factors as our test.” (Kudos to the Kagan chambers: no party in this case appears to have cited to the $8,500 case at all.) Or, as the federal government wrote in its brief, in order to evaluate sentencing delays the Court would, at best, have to “modify the speedy-trial analysis to resemble the due process framework.” This idea – using the speedy trial Barker v. Wingo factors to evaluate sentencing delay claims under the Due Process Clause, and relying on the “flexibility” of due process to fashion appropriate remedies – appeared to carry the Court for the remainder of the argument. How far will the Court go in settling the details of sentencing delay claims and remedies? A possible result in this case could be for the Court simply to answer the question presented — “Does the Speedy Trial right apply to sentencing?” – in the negative, and then call it a day. But the Justices who spoke seemed quite interested in addressing some of the details. If anyone can muster a majority (or, as the Justices likely prefer, unanimity), the Court might well go on to spell out some general rules, even if it affirms the Montana judgment that Betterman himself is entitled to no relief. Of course, the Court could also remand for reconsideration under whatever new due process guidelines if offers – but Betterman’s decision not to argue the due process claim might undercut that path. First, to make out a claim, what kind of delay in sentencing must be shown? Under Barker’s four factors, an (1) “unreasonable” or “deliberate” delay (2) attributable to the state is required, and the (3) defendant must affirmatively assert his right. The Barker Court candidly noted that evaluation of delay claims is “necessarily” fact specific and “ad hoc.” Meanwhile, the Montana Supreme Court described the delay in Betterman’s case as “unacceptable.” Whether that constitutes a constitutional due process violation is debatable (for example, Betterman did not invoke his “right” until nine of the fourteen months had passed). But since the due process claim was not argued here, the Court may not rule definitively. Instead, it is Barker’s fourth factor, “prejudice,” that is really at play in this case (as well as remedy). As Justice Breyer pointed out, Barker does require a showing of prejudice; it is not “presumed” except in cases of “extreme” speedy trial delay. Betterman argues that he has due process “liberty” interests in a fair sentencing hearing, access to rehabilitation programs with which delay interferes, and as short a sentence as possible (including time-served interests). Betterman also argues, and Barker indicates, that “anxiety” of a defendant caused by delay can count. “Prejudice” to these interests, where a sentencing delay claim meets the first three factors, ought to lead to remedy, says Betterman. 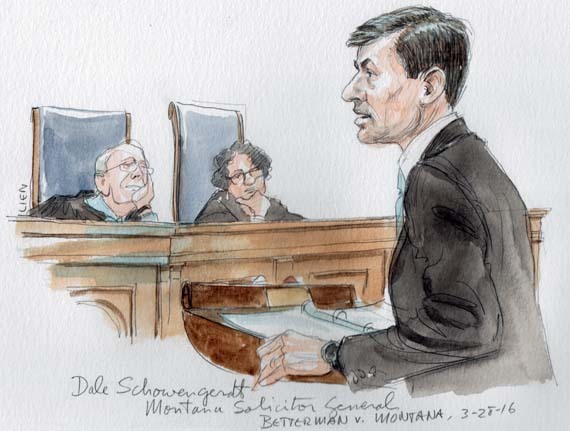 As Schowengerdt, arguing for Montana, ultimately conceded, if the Barker factors are adjusted to the realities of the sentencing process, then “it comes down to remedy.” Rather than dismissal, Betterman argued for a “proportionate, tailored, remedy.” Justice Alito noted that simply reducing a sentence by the length of delay might not satisfy that standard. Not much more remedial detail was discussed. So expect the opinion to say only that even though a Barker analysis may apply, the Barker remedy of complete dismissal is not appropriate; due process permits more flexible responses. One last interesting point (other than Justice Anthony Kennedy asking, but not getting an answer, about whether the Speedy Trial Act applies to a retrial after appellate remand – it does): Justice Kagan perspicaciously noted that the penalty phase of a capital cases “really is a trial” – suggesting (another unbriefed point) that perhaps the Sixth Amendment’s speedy trial protection should apply in capital sentencing proceedings. Assistant to the Solicitor General Anders gamely replied that “capital cases may be different.” Watch for a footnote to that effect here. Because much of the argument seemed to focus on details of a due process claim and remedy that were not much argued in the briefs, one wonders how far the Court will go in setting down specifics. Still, it would be beneficial to offer as much specificity, or at least general thoughts, as the eight-member Court can muster. The Supreme Court takes cases on discrete constitutional topics so infrequently, and in so few cases, that an essential part of its role is to provide as much guidance as possible to assist lower state and federal courts in deciding, and thousands of lawyers in litigating, the thousands of cases they collectively confront on the topic every year. We’ll see how much guidance, beyond the binary constitutional question presented, the Court can agree on here.